Nicht die Sprache der Dinge, sondern das Sprechen mit den Dingen. Darum geht es in meinem Beitrag zum gerade beim Waxmann Verlag erschienenen Buch Die Sprache der Dinge. 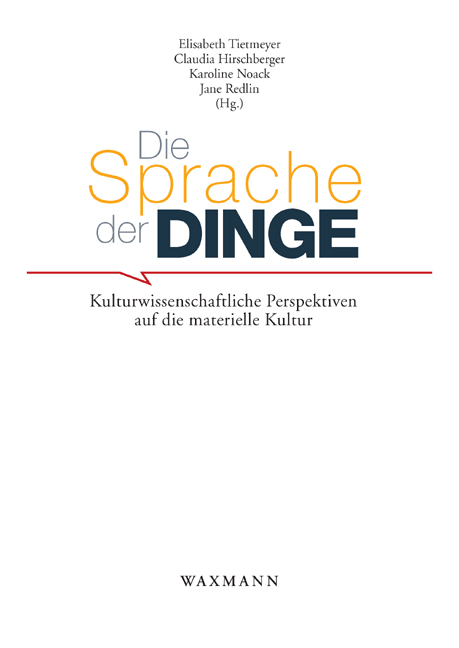 Ich freue mich sehr darüber, in diesem Buch dabei zu sein, da die meisten anderen Beiträge aus der Volkskunde/Ethnologie kommen und da das Buch zur Ausleuchtung des in Deutschland noch unterbelichteten Felds der materiellen Kultur beisteuert. Mein herzlicher Dank geht natürlich an die Herausgeberinnen des Bandes. Es gibt auch eine Übersicht zum Seminar. Viel Spaß beim Lesen! Doorology or social science making the news. Opening, Closing, and Revolving – Studies in Doorology. This contribution will unfold the life of an artifact on the border: the door. Based on field observations and digital video recordings of doors and their use in railway and ferry terminals I want to present the door as an entity that participates in the everyday lives of commuters and travelers, old and young, men and women. The door has many aspects that make it a very peculiar and highly interesting object of study for researchers in the social sciences. One of the most prominent aspects is its inherent duality – it is one of the most basic devices of exclusion and inclusion. It can be inviting and open but it can also shut out the unwelcome or unable. The door establishes a visual and material barrier that has to be taken to access whatever lies on the other side. But the door also is a mundane technological artifact with quite specific properties depending on the way it is designed. Sliding doors make up a very thin barrier while revolving doors cover a large amount of space. Doors may work automatically or be pushed and pulled by the hands, feet and shoulders of the people that walk or roll trough them. The presentation will focus on the way in which the life of different kinds of doors is intertwined with the lives of the people that use them. Some of the stories that will be told are linear narrations that talk about reaching a goal lying far away from the door itself. Other stories will be of a more Kafkaesque nature – they will revolve around doors that confront some people with a weakness they probably do not like to display in public while others pass through seemingly undisturbed, pursuing their everyday lives and ignoring the door as an entity with its own curious life. Telling these stories, the presentation will alternate between talk, the showing of video clips, and still photographs of doors or the people using them. Particular focus will be put on the social reconfigurations that happen in contact with the door. Following is my abstract for the session Ordering / Disordering Space and Matter of the 2006 Meeting of the AAG, March 7-11, Chicago, Illinois. Based on ethnographic research in railway stations and passenger terminals for ferries, this paper wedges itself between people and the things they encounter. Detailed analysis of digital video recordings allows insight into the brief exchanges between men, women and artifacts. Sometimes, these exchanges do not unfold as planned, irritations arise and expectations are thwarted causing a reordering of conduct. Artifacts like the ticket selling machine or the materiality of a revolving door can break established routines thereby opening spaces for play or interaction with others. Terminals with their ticket selling counters, their shops and waiting facilities are places of a distinct phenomenologically accessible materiality; this paper will get involved in this materiality, tracing the relations between people, things, and socio-spatial constellations to understand how the rule of a certain normality is established in terminals and when and how it is destabilized. Den Text habe ich zwar schon im Mai geschrieben, und die Seite auch schon im Juni fertig gecodet, aber erst heute mache ich meinen Text zu den Begriffen Dinge und Materialität, Praxis und Perfomativität online verfügbar. Ich habe den Text im Anschluß an meine Präsentation im Graduiertenkolleg am 21. Mai geschrieben, um in der Diskussion aufgekommene Fragen zu klären und dem provisorischen und offenen Charakter der Präsentation noch etwas solideres folgen zu lassen. Bevor ich den Text ins Netz befördere wollte ich unter anderem noch Rücksprache mit meinem Betreuer und anderen halten; dies ist nun geschehen und jetzt solls endlich neue Inhalte auf meiner Seite geben! In den nächsten Tagen werde ich auch den ersten Teil meiner Merleau-Ponty Verwurstung fertig geschrieben haben und ihn ebenfalls auf den Webserver hochladen.